The ISHOF Awards were hosted by Dr Robert Goldman & Governor Arnold Schwarzenegger. KEVIN NGUYEN WINS OVERALL MEN'S PHYSIQUE TITLE! This is the Blu-ray version where Kevin Nguyen of USA won the overall Men's Physique title as more than 600 of the top amateur competitors from around the world competed in 10 divisions at the 12th Annual Arnold Amateur NPC International Championships. YOU MAY ALSO ORDER AN HD VIDEO FILE OF ANY CLASS OF YOUR CHOICE - INCLUDING THE CLASS AWARDS, TO BE EMAILED TO YOUR INBOX, US$35 PER CLASS. See the lineups, comparisons and callouts for all 6 classes, all awards through to the OVERALL AWARD to Kevin Nguyen, MEN’S PHYSIQUE CHAMPION for 2018. The second part of this DVD contains the full event of the 2018 International Sports Hall of Fame Inductee Ceremony. Held on Saturday, March 3, 2018 in Columbus, Ohio. It was hosted by Dr Robert Goldman and Governor Arnold Schwarzenegger. The Inductees were Drs Terry and Jan Todd, Bas Rutten, Ronda Rousey and Phil Keoghan. The awards also include Ronda's mother AnnMaria DeMars. Plus speeches from Arnold Schwarzenegger and Jim Lorimer. Special thanks to Bob Lorimer and Live Technologies for providing the Men’s Physique video content in this DVD. The ISHOF Ceremony footage was shot by Wayne Gallasch of GMV. 2018 Arnold Amateur NPC Men's Bodybuilding & Classic Physique - Men's DVD #2. MIKHAIL VOLINKIN WINS OVERALL MEN'S BODYBUILDING TITLE! LUCAS DISANTI of USA takes out the Overall Classic Physique title. See all the rounds of every class through to the class awards and Overall Awards. This is Men's DVD #2 of 2. 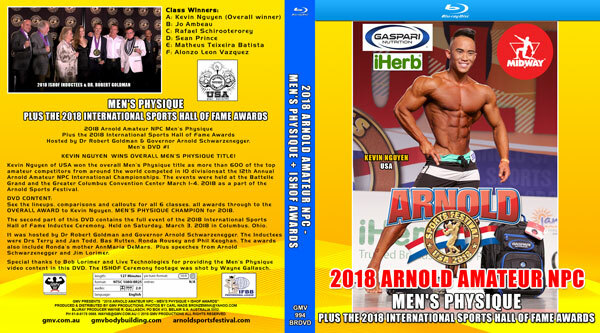 2018 Arnold Amateur NPC Men's Physique & International Sports Hall of Fame Awards - Men's DVD #1. See the regular SD version of this DVD with the lineups, comparisons and callouts for all 6 classes, all awards through to the OVERALL AWARD to Kevin Nguyen, MEN’S PHYSIQUE CHAMPION for 2018. The second part of this DVD contains the full event of the 2018 International Sports Hall of Fame Inductee Ceremony, hosted by Dr Robert Goldman and Governor Arnold Schwarzenegger.